While he may seem like your average overly-nervous seventh grader, Trevor Jones has something special going for him: a documentary film crew is following him around as he starts middle school. Unfortunately, most of his misadventures with a confusing school layout, evil eighth graders, and bizarre staff members are not something he would want to preserve. The Classroom: The Epic Documentary of a Not-Yet-Epic Kid is the latest novel which tries to capitalize on the success of The Diary of a Wimpy Kid series. Rather than going for the diary format of so many imitators, author Stephen Gilpin chose a loosely organized documentary. It wasn't enough. Although Trevor has his quirks, he is a bland character, and so are the other stereotypes that pepper the book. I kept hoping for more, and this went on for awhile, because The Classroom is too long for the audience it is geared towards. 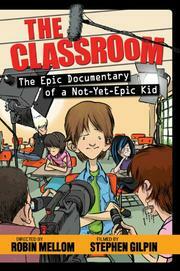 The cover of The Classroom will grab plenty of readers; I'm curious to see how many of my students actually finish it.